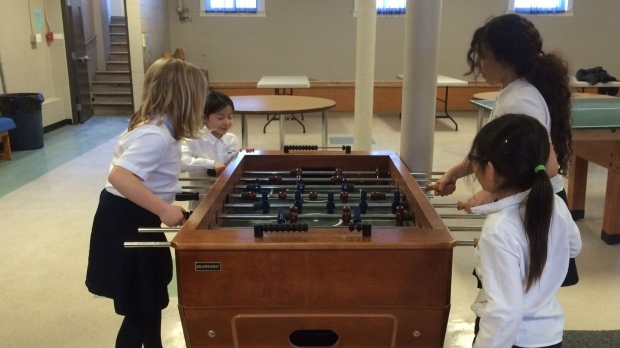 Students enjoy a game of foosball at the St. Charles Catholic School before-and-after-school care facility. Winnipeg parents are finding it difficult to get child care before and after school. It’s an issue that hits close to home for Winnipeg mom Heather Young. She just moved to Winnipeg and is trying to sign up her 3-year-old son Hunter for kindergarten two years in advance. 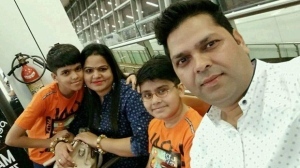 Young said the only school in her catchment area has a before-and-after-school child care facility attached to it, the problem is, Young was told it will be a four to five year wait to get her son a space in that daycare. Young said finding a different school with child care outside her catchment area has also been a challenge. Young said some schools she’s contacted aren’t accepting families from outside the catchment area because of the Manitoba government’s new reduced class size initiative. According to the Manitoba Child Care Association only 12 per cent of the population has access to before and after school care. That leaves many other families forced to find alternate options for their children such as a family member, friend or an unlicensed neighbourhood babysitter. St. Charles Catholic School offers guaranteed before and after school care for families who enroll their kids at the school. Coordinator Kim Furutani said the program grows ever year. “We just had our open house and some of the things people had asked me was ‘so I won’t have to be on a waiting list and things like that’ and we said, nope, automatically if you’re in our school you’re on our school program for after school,” said Furutani. With the provincial election on April 19, MCCA executive director Pat Wege wants child care to be a top priority. The Manitoba NDP has promised to create 12, 000 additional child care spaces over the course of 5-7 years. The Manitoba Liberal Party said its committed to creating spaces in an aggressive way, adding the details are still come. The Manitoba Progressive Conservative Party said that there are approximately 13,000 children in total are waiting for a child care space and that number is quickly increasing. "We believe in more accessible, safe child care spaces and flexible solutions for getting kids the care they need," they said.